Dr. Hudson discusses his paper, The IMF Changes Its Rules To Isolate China and Russia; implications of the four policy changes at the International Monetary Fund in its role as enforcer of inter-government debts; the Shanghai Cooperation Organization (SCO) as an alternative military alliance to NATO; the Asian Infrastructure Investment Bank (AIIB) threatens to replace the IMF and World Bank; the Trans Pacific Partnership Treaty; the China International Payments System (CIPS); WTO investment treaties; Ukraine and Greece; different philosophies of development between east and west; break up of the post WWII dollarized global financial system; the world dividing into two camps. A nightmare scenario of U.S. geopolitical strategists is coming true: foreign independence from U.S.-centered financial and diplomatic control. China and Russia are investing in neighboring economies on terms that cement Eurasian integration on the basis of financing in their own currencies and favoring their own exports. They also have created the Shanghai Cooperation Organization (SCO) as an alternative military alliance to NATO.And the Asian Infrastructure Investment Bank (AIIB) threatens to replace the IMF and World Bank tandem in which the United States holds unique veto power. More than just a disparity of voting rights in the IMF and World Bank is at stake. At issue is a philosophy of development. U.S. and other foreign investment in infrastructure (or buyouts and takeovers on credit) adds interest rates and other financial charges to the cost structure, while charging prices as high as the market can bear (think of Carlos Slim’s telephone monopoly in Mexico, or the high costs of America’s health care system), and making their profits and monopoly rents tax-exempt by paying them out as interest. By contrast, government-owned infrastructure provides basic services at low cost, on a subsidized basis, or freely. That is what has made the United States, Germany and other industrial lead nations so competitive over the past few centuries. But this positive role of government is no longer possible under World Bank/IMF policy. The U.S. promotion of neoliberalism and austerity is a major reason propelling China, Russia and other nations out of the U.S. diplomatic and banking orbit. On December 3, 2015, Prime Minister Putin proposed that Russia “and other Eurasian Economic Union countries should kick-off consultations with members of the SCO and the Association of Southeast Asian Nations (ASEAN) on a possible economic partnership.”Russia also is seeking to build pipelines to Europe through friendly secular countries instead of Sunni jihadist U.S.-backed countries locked into America’s increasingly confrontational orbit. What especially annoys U.S. financial strategists is that this loan by Russia’s National Wealth Fund was protected by IMF lending practice, which at that time ensured collectability by withholding credit from countries in default of foreign official debts, or at least not bargaining in good faith to pay. To cap matters, the bonds are registered under London’s creditor-oriented rules and courts. Most worrisome to U.S. strategists is that China and Russia are denominating their trade and investment in their own currencies instead of dollars. After U.S. officials threatened to derange Russia’s banking linkages by cutting it off from the SWIFT interbank clearing system, China accelerated its creation of the alternative China International Payments System (CIPS), and its own credit card system to protect Eurasian economies from the threats made by U.S. unilateralists. Russia and China are simply doing what the United States has long done: using trade and credit linkages to cement their diplomacy. This tectonic geopolitical shift is a Copernican threat to New Cold War ideology: Instead of the world economy revolving around the United States (the Ptolemaic idea of America as “the indispensible nation”), it may revolve around Eurasia. As long as global financial control remains grounded in Washington at the offices of the IMF and World Bank, such a shift in the center of gravity will be fought with all the power of an American Century (and would-be American Millennium) inquisition. Any inquisition needs a court system and enforcement vehicles. So does resistance to such a system. That is what today’s global financial, legal and trade maneuvering is all about. And that is why today’s world system is in the process of breaking apart. Differences in economic philosophy call for different institutions. To U.S. neocons the specter of AIIB government-to-government investment creates fear of nations minting their own money and holding each other’s debt in their international reserves instead of borrowing dollars, paying interest in dollars and subordinating their financial planning to the U.S. Treasury and IMF. Foreign governments would have less need to finance their budget deficits by selling off key infrastructure. And instead of dismantling public spending, a broad Eurasian economic union would do what the United States itself practices, and seek self-sufficiency in banking and monetary policy. Imagine the following scenario five years from now. China will have spent half a decade building high-speed railroads, ports, power systems and other construction for Asian and African countries, enabling them to grow and export more. These exports will be coming online to repay the infrastructure loans. Also, suppose that Russia has been supplying the oil and gas energy for these projects on credit. How can China or Russia collect in such a situation? They can sue. But what court in the West will accept their jurisdiction? That is the kind of scenario U.S. State Department and Treasury officials have been discussing for more than a year. Implementing it became more pressing in light of Ukraine’s $3 billion debt to Russia falling due by December 20, 2015. Ukraine’s U.S.-backed regime has announced its intention to default. To support their position, the IMF has just changed its rules to remove a critical lever on which Russia and other governments have long relied to ensure payment of their loans. When it comes to enforcing nations to pay inter-government debts, the IMF is able to withhold not only its own credit but also that of governments and global bank consortia participating when debtor countries need “stabilization” loans (the neoliberal euphemism for imposing austerity and destabilizing debtor economies, as in Greece this year). Countries that do not privatize their infrastructure and sell it to Western buyers are threatened with sanctions, backed by U.S.-sponsored “regime change” and “democracy promotion” Maidan-style. The Fund’s creditor leverage has been that if a nation is in financial arrears to any government, it cannot qualify for an IMF loan – and hence, for packages involving other governments. That is how the dollarized global financial system has worked for half a century. But until now, the beneficiaries have been U.S. and NATO lenders, not been China or Russia. The target was not only Russia and its ability to collect on its sovereign loan to Ukraine, but China even more, in its prospective role as creditor to African countries and prospective AIIB borrowers, planning for a New Silk Road to integrate a Eurasian economy independent of U.S. financial and trade control. The Wall Street Journal concurred that the main motive for changing the rules was the threat that China would provide an alternative to IMF lending and its demands for crushing austerity. “IMF-watchers said the fund was originally thinking of ensuring China wouldn’t be able to foil IMF lending to member countries seeking bailouts as Beijing ramped up loans to developing economies around the world.” So U.S. officials walked into the IMF headquarters in Washington with the legal equivalent of suicide vests. Their aim was a last-ditch attempt to block trade and financial agreements organized outside of U.S. control and that of the IMF and World Bank. change its practice of not lending into [countries in official] arrears … because it is not incorporated into the IMF Articles of Agreement, that is, the IMF statutes. The IMF Executive Board can decide to change this policy with a simple board majority. The IMF has lent to Afghanistan, Georgia, and Iraq in the midst of war, and Russia has no veto right, holding only 2.39 percent of the votes in the IMF. When the IMF has lent to Georgia and Ukraine, the other members of its Executive Board have overruled Russia. After the rules change, Aslund later noted, “the IMF can continue to give Ukraine loans regardless of what Ukraine does about its credit from Russia, which falls due on December 20. The IMF rule that no country can borrow if it is in default to a foreign government was created in the post-1945 world. Since then, the U.S. Government, Treasury and/or U.S. bank consortia have been party to nearly every major loan agreement. But inasmuch as Ukraine’s official debt to Russia’s National Wealth Fund was not to the U.S. Government, the IMF announced its rules change simply as a “clarification.” What its rule really meant was that it would not provide credit to countries in arrears to the U.S. government, not that of Russia or China. The post-2010 loan packages to Greece are a case in point. The IMF staff saw that Greece could not possibly pay the sums needed to bail out French, German and other foreign banks and bondholders. Many Board members agreed, and have gone public with their whistle blowing. Their protests didn’t matter. President Barack Obama and Treasury Secretary Tim Geithner pointed out that U.S. banks had written credit default swaps betting that Greece could pay, and would lose money if there were a debt writedown). Dominique Strauss-Kahn backed the hard line US- European Central Bank position. So did Christine Lagarde in 2015, overriding staff protests. Regarding Ukraine, IMF executive board member Otaviano Canuto, representing Brazil, noted that the logic that “conditions on IMF lending to a country that fell behind on payments [was to] make sure it kept negotiating in good faith to reach agreement with creditors.” Dropping this condition, he said, would open the door for other countries to insist on a similar waiver and avoid making serious and sincere efforts to reach payment agreement with creditor governments. 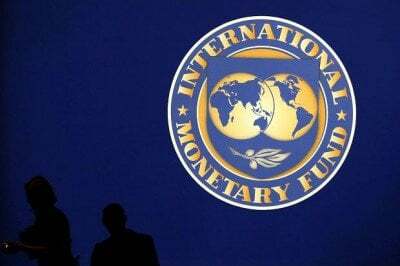 A more binding IMF rule is Article I of its 1944-45 founding charter, prohibiting the Fund from lending to a member state engaged in civil war or at war with another member state, or for military purposes in general. But when IMF head Lagarde made the last loan to Ukraine, in spring 2015, she merely expressed a vapid token hope there might be peace. Withholding IMF credit could have been a lever to force peace and adherence to the Minsk agreements, but U.S. diplomatic pressure led that opportunity to be rejected. President Porochenko immediately announced that he would step up the civil war with the Russian-speaking population in the eastern Donbass region. Not to lend to a country that has no visible means to pay back the loan. This breaks the “No More Argentinas” rule, adopted after the IMF’s disastrous 2001 loan. Not to lend to a country that repudiates its debt to official creditors. This goes against the IMF’s role as enforcer for the global creditor cartel. Not to lend to a borrower at war – and indeed, to one that is destroying its export capacity and hence its balance-of-payments ability to pay back the loan. Finally, not to lend to a country that is not likely to carry out the IMF’s austerity “conditionalities,” at least without crushing democratic opposition in a totalitarian manner. The upshot – and new basic guideline for IMF lending – is to split the world into pro-U.S. economies going neoliberal, and economies maintaining public investment in infrastructure n and what used to be viewed as progressive capitalism. Russia and China may lend as much as they want to other governments, but there is no global vehicle to help secure their ability to be paid back under international law. Having refused to roll back its own (and ECB) claims on Greece, the IMF is willing to see countries not on the list approved by U.S. neocons repudiate their official debts to Russia or China. Changing its rules to clear the path for making loans to Ukraine is rightly seen as an escalation of America’s New Cold War against Russia and China. A more immediate reason deterring the United States from pressing earlier to change IMF rules was the need to use the old set of rules against Greece before changing them for Ukraine. A waiver for Ukraine would have provided a precedent for Greece to ask for a similar waiver on paying the “troika” – the European Central Bank (ECB), EU commission and the IMF itself – for the post-2010 loans that have pushed it into a worse depression than the 1930s. Only after Greece capitulated to eurozone austerity was the path clear for U.S. officials to change the IMF rules to isolate Russia. But their victory has come at the cost of changing the IMF’s rules and those of the global financial system irreversibly. Other countries henceforth may reject conditionalities, as Ukraine has done, as well as asking for write-downs on foreign official debts. The consequences of America’s tactics to make a financial hit on Russia while its balance of payments is down (as a result of collapsing oil and gas prices) go far beyond just the IMF. These tactics are driving other countries to defend their own economies in the legal and political spheres, in ways that are breaking apart the post-1945 global order. Over the past year the U.S. Treasury and State Departments have discussed ploys to block Russia from collecting by suing in the London Court of International Arbitration, under whose rules Russia’s bonds issued to Ukraine are registered. Reviewing the excuses Ukraine might use to avoid paying Russia, Prof. Gelpern noted that it might declare the debt “odious,” made under duress or corruptly. In a paper for the Peterson Institute of International Economics (the banking lobby in Washington) she suggested that Britain should deny Russia the use of its courts as a means of reinforcing the financial, energy and trade sanctions passed after Crimea voted to join Russia as protection against the ethnic cleansing from the Right Sector, Azov Battalion and other paramilitary groups descending on the region. A kindred ploy might be for Ukraine to countersue Russia for reparations for “invading” it and taking Crimea. Such a claim would seem to have little chance of success (without showing the court to be an arm of NATO politics), but it might delay Russia’ ability to collect by tying the loan up in a long nuisance lawsuit. But the British court would lose credibility if it permits frivolous legal claims (called barratry in English) such as President Poroshenko and Prime Minister Yatsenyuk have threatened. To claim that Ukraine’s debt to Russia was “odious” or otherwise illegitimate, “President Petro Poroshenko said the money was intended to ensure Yanukovych’s loyalty to Moscow, and called the payment a ‘bribe,’ according to an interview with Bloomberg in June this year.” The legal and moral problem with such arguments is that they would apply equally to IMF and U.S. loans. They would open the floodgates for other countries to repudiate debts taken on by dictatorships supported by IMF and U.S. lenders. Implicit was that if the West continued encouraging Ukraine to fight against the East, its government would not be in a position to pay. The Minsk agreement was expiring and Ukraine was receiving new arms support from the United States, Canada and other NATO members to intensify hostilities against Donbas and Crimea. In an exasperated tone, Prime Minister Dmitry Medvedev said on Russian television: “I have a feeling that they won’t give us the money back because they are crooks … and our Western partners not only refuse to help, but they also make it difficult for us.” Accusing that “the international financial system is unjustly structured,” he nonetheless promised to “go to court. We’ll push for default on the loan and we’ll push for default on all Ukrainian debts,” based on the fact that the loan was a request from the Ukrainian Government to the Russian Government. If two governments reach an agreement this is obviously a sovereign loan…. Surprisingly, however, international financial organisations started saying that this is not exactly a sovereign loan. This is utter bull. Evidently, it’s just an absolutely brazen, cynical lie. … This seriously erodes trust in IMF decisions. I believe that now there will be a lot of pleas from different borrower states to the IMF to grant them the same terms as Ukraine. How will the IMF possibly refuse them? Adding his own bluster, Prime Minister Arseny Yatsenyuk announced his intention to tie up Russia’s claim for payment by filing a multibillion-dollar counter claim “over Russia’s occupation of Crimea and intervention in east Ukraine.” To cap matters, he added that “several hundred million dollars of debt owed by two state enterprises to Russian banks would also not be paid.” This makes trade between Ukraine and Russia impossible to continue. Evidently Ukraine’s authorities had received assurance from IMF and U.S. officials that no real “good faith” bargaining would be required to gain ongoing support. Ukraine’s Parliament did not even find it necessary to enact the new tax code and Michael Hudson: U.S. admits lack of prospects of restoring Ukrainian solvency,” November 7, 2015, translated on Johnson’s Russia List, December 7, 2015, #38. Andrew Mayeda, “IMF Says Ukraine Bond Owned by Russia Is Official Sovereign Debt,” Bloomberg, December 17, 2015. Andrew E. Kramer, “Ukraine Halts Repayments on $3.5 Billion It Owes Russia,” The New York Times, December 19, 2015. Roman Olearchyk, “Ukraine tensions with Russia mount after debt moratorium,” Financial Times, December 19, 2015. “Violence instead of democracy: Putin slams ‘policies of exceptionalism and impunity’ in UN speech,” www.rt.com, September 29, 2015. From Johnson’s Russia List, September 29, 2015, #2.